View captions by moving your mouse over the image for the text drop down. Click on the icon to view the next image in the slideshow, and the icon to view the previous image. Click on the icon to see other expedition slideshows. Click on any image in the playlist to download a file or get additional information. You may need to download the Flash browser plugin. View images from the NOAA Ship Okeanos Explorer during the Gulf of Mexico 2012 Expedition, follow the daily updates, mission logs, video and LIVE Video Feeds. NOAA's Office of Ocean Exploration and Research guides Okeanos Explorer, known as “America’s ship for ocean exploration,” as the ship travels the globe to map and characterize largely unknown areas of the ocean. Scientists on board Okeanos Explorer use tools such a deepwater multibeam sonar mapping system and remotely operated vehicles (ROV) to explore at depths down to 4,000 meters. Images and high-definition video from ROVs are sent from the seafloor to the ship and to shore in real-time using a technology referred to as “telepresence.” Although Okeanos Explorer may be thousands of miles away, the scientists standing watch at shore-side "exploration command centers" throughout the country are able to help guide the ship through its mission. And the same seafloor images and video seen by scientists are streamed live into classrooms, newsrooms, and living rooms through high-speed Internet. Be sure to click the icon to see other videos and slideshows from 2008-2012 expeditions. Images courtesy of NOAA Okeanos Explorer Program. View a slideshow of highlight images captured by the Little Hercules ROV on Leg III of the expedition, August 2010. View some of the stunning imagery collected by the Little Hercules ROV during its dives from July 2010. View a slideshow of the unique deep-sea coral communities found near the Naung Seamount and 'Target K'. Learn more about the NOAA Corps Officers working aboard Okeanos Explorer in this slideshow of images. View a slideshow of images and biographies of the ROV Operations Team onboard the Okeanos Explorer. View a slideshow of images of the 'Celebrities of the Celebes Sea' from the June 30 dive on the Kawio Barat volcano. View a slideshow of images from the Okeanos Explorer Welcoming Ceremony in Bitung, Indonesia on June 23, 2010. View a slideshow of images from the Indonesian R/V Baruna Jaya IV, partnering with the Okeanos Explorer for the INDEX 2010 Expedition. View a slideshow of images from the Okeanos Explorer Virtual Tour. View a slideshow of extraordinary highlight images from the Okeanos Explorer shakedown cruise offshore Kona, Hawaii in March 2010. View a slideshow of the NOAA Ship Okeanos Explorer "Life at Sea" images. View a slideshow of the NOAA Ship Okeanos Explorer commissioning at Pier 66 in Seattle, WA. View some of the spectacular underwater footage captured by the Little Hercules ROV on July 11. View some of the spectacular underwater footage captured by the Little Hercules ROV on July 10. View some of the spectacular underwater footage captured by the Little Hercules ROV on July 9. View some of the spectacular underwater footage captured by the Little Hercules ROV on July 8. View some of the spectacular underwater footage captured by the Little Hercules ROV on July 6. View some of the spectacular underwater footage captured by the Little Hercules ROV on July 5. View some of the spectacular underwater footage captured by the Little Hercules ROV on July 3. View some of the spectacular underwater footage captured by the Little Hercules ROV on July 2. View some of the spectacular underwater footage captured by the Little Hercules ROV on July 1. View a video of footage captured on June 29th during the first ROV dive of INDEX 2010 down to Kawio Barat volcano. View a video of the arrival of the NOAA Ship Okeanos Explorer for its first port call in Bitung, Indonesia, during its maiden voyage. Video footage of a scleractinian hard coral, which may be 1,000 to 6,000 years old. Video footage of a deep-ocean sea spider measuring eight to 12 inches across. Video footage of a purple sea cucumber with a high 'spike' protruding from its dorsal section. Video footage of active vents at Kawio Barat submarine volcano. Video footage of galatheid crabs feasting opportunistically on a pelagic catch. Video footage of a jellyfish initially encountered drifting with its tentacles extended, waiting to encounter prey. Video footage of a deep-sea chimaera captured by the Little Hercules ROV and Camera Platform. Video footage of a benthopelagic sea cucumber swimming in the near freezing waters of the abyss, about 3200 meters deep. View a video podcast of the NOAA Ship Okeanos Explorer and its multibeam mapping discovery on the Mendocino Ridge. View an extraordinary highlight video of the marine life offshore Kona, Hawaii. 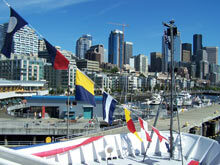 View a video of the NOAA Ship Okeanos Explorer commissioning at Pier 66 in Seattle, WA. View a video of the Navy Stalwart class USNS Capable being converted into the NOAA Ship Okeanos Explorer at the Todd Pacific Shipyard. A virtual tour of the INDEX 2010 operating area and findings, using Ocean in Google Earth, part of a collaboration between NOAA and Google. 24 minute highlight video focusing on spectacular benthic footage from Leg 2 of the INDEX 2010 Exploration. 32 minute highlight video showcasing some of the amazing seafloor imagery from Leg 3 of the INDEX 2010 Exploration.